Colleyville Heritage takes over at No. 1, Orange Lutheran wins National High School Invitational and moves up to No. 5. Southern California continues to rule the National High School Invitational and as a result the MaxPreps national Top 25 Baseball Rankings have a new No. 1 team. 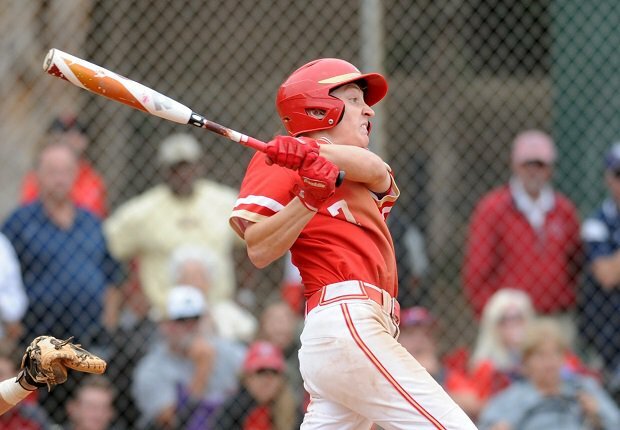 Orange Lutheran (Orange, Calif.) captured the NHSI championship for the third straight season and the title marked the seventh time in eight years that a Southern California team has won the tournament, held in Cary (N.C.) and is hosted by Team USA Baseball. The Lancers defeated Harvard-Westlake (Studio City, Calif.) 6-2 to claim the championship, one week after it finished as the consolation champion at the Boras Classic Tournament in Southern California. See where teams landed after last week's NHSI tournament in North Carolina. Orange Lutheran's win meant that the No. 1 team in the nation, previously undefeated IMG Academy (Bradenton, Fla.), lost during tournament play, however the Ascenders did not lose to either Orange Lutheran or Harvard-Westlake. IMG Academy lost 3-2 to Blessed Trinity (Roswell, Ga.) on a walk-off double in the bottom of the eighth inning of a second-round game. The Ascenders had defeated Blessed Trinity 10-0 earlier this year in the Perfect Game Showdown championship and thus dropped only to No. 2 in this week's rankings. Blessed Trinity lost in the semifinals to Harvard-Westlake and then fell to Monsignor Pace (Miami) in the third-place game. The Titans remain in the rankings this week at No. 25 due to their win over IMG Academy. Orange Lutheran, which had dropped to No. 17 after its consolation finish at the Boras Classic, moved up to No. 5 and is still ranked below IMG Academy despite finishing ahead of the Ascenders at the NHSI due to three losses this season. Colleyville Heritage (Texas) is the new No. 1 team after a pair of blowout wins last week. The Panthers have the No. 1 player in the nation in Bobby Witt Jr., who leads the nation in home runs with 11. The Panthers moved from No. 3 to No. 1 after previous No. 2 Lake Travis (Austin, Texas) lost to Akins in District play. The Cavaliers dropped to No. 6. New Teams: No. 17 Nova (Davie, Fla.), No 18 Westminster Christian (Miami), No. 20 Calvary Christian Academy (Fort Lauderdale, Fla.), No. 22 Fort Bend Ridgepoint (Missouri City, Texas), No. 23 JSerra Catholic (San Juan Capistrano, Calif.), No. 24 Davie (Mocksville, N.C.). Dropped out: No. 7 Doral Academy (Fla.), lost three times; No. 12 Parkview (Lilburn, Ga.), los twice; No. 14 Christian Brothers (St. Louis, Mo. ), lost three times; No. 16 Memorial (Houston), lost once; No. 19 Huntington Beach (Calif.), lost once, No. 25 Owasso (Okla.), lost once. On the Bubble: Bob Jones 29-6, Bryant, 19-2, Ayala 19-3, Yucaipa 15-4, Notre Dame 15-5, De La Salle 10-1, Buchanan 16-2, Eastlake 14-1-1, Regis Jesuit 9-1, St. Thomas Aquinas 12-1, East Lake 12-0, Mosley 12-1, Vero Beach 11-1, Douglas 10-2, MItchell 15-0, Hillgrove 20-4, Tattnall Square Academy 20-1, North Gwinnett 19-4, St. Rita 10-0, Lincoln Way East 11-1, Trinity 10-1, Sam Houston 25-4, Biloxi 21-2, Sumrall 19-3, Palo Verde 15-1, Collierville 17-2, Tomball 19-1-2. Player of the Week: Cameron Repetti helped Cypress win four games last week. He threw a no-hitter against Tustin in a 1-0 win, striking out nine and walking none. In a win over El Toro over the weekend, Repetti went 3-for-4 with a home run and four RBI. Prospect of the Week: J.J. Goss of Cypress Ranch has risen in the ranks among the top pitchers in the Class of 2019 by Perfect Game and helped his cause last week with a perfect game with nine strikeouts against Cypress Park. For the season, Goss is 7-0 with a 0.33 ERA and 79 strikeouts in 42.1 innings pitched. Game of the Week: Blessed Trinity (Roswell) 3, IMG Academy (Bradenton, Fla.), 2. This loss knocked IMG Academy out of the No. 1 spot and included the second and third earned runs of the season given up by the IMG pitching staff. Kendall Williams went six innings and struck out 10 for IMG, but Blessed Trinity got to him for two runs in the bottom of the sixth to take a 2-1 lead. Jake Smith had a double to drive in the tying run and he scored on an error by Williams. IMG tied the game in the top of the seventh when Rece Hinds walked, moved to second on a walk, stole third and scored on a fielder's choice. Blessed Trinity won the game on a single by Ryan Davis and a walk-off double by Smith. Game to Watch: Superiority in Southern California will be decided his week as Orange Lutheran and JSerra Catholic meet for three games, including a doubleheader on Friday. JSerra Catholic won the Boras Classic South, where Orange Lutheran finished as the consolation champion, while Orange Lutheran won the National High School Invitational. The two teams did not play at the Boras Classic and this will be the first meeting between the two teams this year. Streaks: Page County (Shenandoah, Va.) raised its national-best active win streak to 35 games in a row with a pair of wins last week, including a 6-0 no-hitter over Wilson Memorial by T.R. Williams, who was a MaxPreps Freshman All-American last year. He struck out 15 in the win. Results: Defeated Chisholm Trail 9-1 and 11-1. Stats: Nick Balsano went 3-for-4 with three RBI in the first game and Bobby Witt Jr. was 2-for-3 with a double. Witt also had a double in the second game while Logan Britt had a home run. This week: Boswell on Friday. Results: Defeated La Mirada (Calif.) 1-0, lost to Blessed Trinity (Roswell, Ga.), defeated Hagerty (Oviedo, Fla.), 11-1 and Desert Oasis (Las Vegas) 3-1. Stats: Brennan Malone raised his record to 6-0 with a three-hit shutout against La Mirada. He struck out eight and walked three. Kendall Williams struck out 10 in the loss to Blessed Trinity, but Brandon Llewellyn took the loss. Tucker Mitchell had two doubles and a triple, going 4-for-4 with three RBI against Hagerty. Kaito Hara and Will Bartlett each hit a double against Desert Oasis. This week: Doral Academy on Friday. Results: Defeated Bridgeport 14-0 and Springtown 19-2. Stats: Brenden Dixon had a home run against Bridgeport, while Sean Bolin had six strikeouts for the win. Chad Ricker had two doubles and a triple and Dixon had another home run against Springtown. Tate Van Poppel had seven strikeouts. This week: Krum on Tuesday and Brownwood on Friday. Results: Defeated Hoggard 1-0 and North Brunswick 10-0. Stats: Blake Walston struck out 16 in a shutout win over Hoggard. This week: West Brunswick (Shallotte) on Tuesday and South Brunswick (Southport) on Thursday. Results: Won the NHSI for the third straight season. Defeated South Forsyth 8-2, Desert Oasis (Las Vegas) 2-1, Monsignor Pace (Miami) 12-0 (semifinal), Harvard-Westlake 6-2 (championship). Stats: Max Rajcic struck out 10 in the win over South Forsyth. Christian Rodriguez went seven innings against Desert Oasis for the win, striking out seven. Chad Born, Carl Lawson and Rajcic each had a double against Monsignor Pace. Caden Conner was 3-for-3 with a double and four runs scored against Harvard-Westlake. This week: JSerra Catholic on Wednesday and doubleheader on Friday. Results: Lost to Akins 9-5 (Akins 5-run rally in fifth), defeated Austin 12-0. Stats: Brett Baty and Jimmy Lewis both had home runs in loss to Akins. Austin Plante went 3-for-4 with a triple and a home run against Austin. Lewis got the shutout win, striking out seven. This week: Lehman on Tuesday, Westlake on Friday, Georgetown on Saturday. Results: Tied Cypress Falls 3-3. Defeated Cypress Park 12-0. Stats: Braylon Hurd went 2-for-3 with a double against Cypress Falls. J.J. Goss had a perfect game with nine strikeouts against Cypress Park. Ross Thurwalker added two doubles while Ryan Peters had a double and a triple. This week: Cypress Woods on Tuesday and Friday. Results: Defeated Manor 3-0 and 12-2. Stats: Jackson Sioson had two doubles and Grant Wood struck out nine in the first win. Noah Thompson had a triple in the second game. This week: Lake Travis on Saturday. Results: Defeated Acadiana (Lafayette) 6-3 and Comeaux (Lafayette) 4-1. Defeated Lafayette 4-2 in 10 innings. Stats: Brody Drost had a double and a home run and Davis Meche had a home run and three RBI against Acadiana. Carter Quinn added a double against Comeaux. Meche and Damon Fountain both had home runs against Lafayette. This week: Sulphur on Tuesday and LaGrange on Friday. Results: Defeated DePaul College Prep 19-3 and Fenwick 6-0. Had a 12-12 tie with Montini suspended due to darkness. Will resume at later date. Defeated De La Salle (Chicago) 5-4. Stats: Matt McCormick had a home run and Vytas Valincius had a double and a home run against DePaul. McCormick and Jake Vera each had a double against Fenwick. McCormick had a home run against De La Salle. This week: Chicago Mt. Carmel on Monday, Tuesday, Neuqua Valley on Thursday, Clemente on Saturday. Results: Lost in the finals of the NHSI. Defeated Hendersonville (Tenn.) 6-0, Hagerty (Oviedo) 4-0 and Blessed Trinity (Roswell, Ga.) 6-1 (semifinal). Lost to Orange Lutheran 6-2 (championship). Stats: Sam Hliboki went the distance against Hendersonville, striking out eight in the shutout win. Drew Bowser was 3-for-4 with a double against Hagerty. Pete Crow-Armstrong went 3-for-4 with a triple and an RBI against Blessed Trinity. This week: St. Francis (La Canada) on Tuesday, Wednesday and Friday. Results: Defeated Tustin 15-7 and 1-0. Swept a doubleheader from El Toro 9-6 and 8-2. Stats: Cameron Repetti threw a no-hitter against Tustin, striking out 11 with no walks. Tyler Chaffee, Mike Marsh and Peter Werth all hit home runs in the 15-7 win, with Chaffee also hitting a double and Marsh hitting a triple. Luke Davis and Elias Rios both doubled against El Toro in the first game. Davis had a triple and Repetti had a home run in the second game. This week: Plays Valencia (Placentia) on Wednesday, Friday, San Clemente on Saturday. Results: Defeated Southaven 9-0 and 7-3, and beat St. Benedict at Auburndale 5-0. Stats: Shemaar Stapleton was 2-for-2 with an RBI in the first win. Kyle Booker had a double in the second game. Gabe Moore had nine strikeouts against St. Benedict. This week: Horn Lake on Tuesday, Hernando on Friday, Olive Branch on Saturday. Results: Defeated Red Mountain 8-1 and 10-0, and Westwood 3-2. Stats: Thome Nickelson had two triples in the first win over Red Mountain while Cam Jowaiszas had two doubles and four RBI in the second win. Jowaiszas and Dallas Wise each had a double against Westwood. This week: Westwood on Tuesday, Skyline on Thursday and Friday. Results: Defeated Plainview 10-0 and 3-2, and Norman North 5-3. Stats: Jace Beck hit a home run and picked up the shutout win over Plainview, striking out 11 with no walks. Payton Miller struck out 11 in the second game and Ty Vanmeter hit a home run. Vanmeter, Callen Golloway and Bryce Madron all hit home runs against Norman North. This week: Ada doubleheader on Monday. Results: Defeated Monacan 16-4, Deep Run 7-1, Lee Davis 10-0. Stats: Jamari Baylor and Jack Hall each had two hits with a double while Brett Allen had a triple against Monacan. Hall had a double and a triple against Deep Run while Bennett Lloyd had two doubles. Jay Woolfolk got the win against Lee Davis, striking out nine. This week: Atlantic Shores Christian on Tuesday, Miller on Thursday. Results: Won the Mingo Bay Classic two weeks ago, including a win over Louisville (Ohio), which defeated Westminster Christian (Miami). Last week, defeated Hollywood Hills 21-0 and Saint Peter's Prep (Jersey City, N.J.), 11-2. Stats: Jared Campbell had a home run against Hollywood Hills and St. Peter's Prep. This week: Cooper City on Tuesday, Piper on Thursday, Deerfield Beach on Friday. Results: Defeated American Heritage (Plantation) 3-2 and Ransom Everglades 11-1. Stats: Sal Stewart had a home run against American Heritage. Jamar Fairweather had a home run against Ransom Everglades. This week: Jupiter on Monday, Southwest on Thursday, Brito on Friday. Results: Lost to Westminster Christian 3-2, defeated Hialeah Educational Academy 6-0, and Gulliver Prep 6-3. Stats: Devin Futrell got the win against Hialeah, striking out six. Santiago Garavito had a double. This week: Calvary Christian Academy (Fort Lauderdale) on Tuesday, Park Vista on Wednesday. Results: Won 12 in a row since opening game loss to Flanagan. Last week: defeated University 7-1 and Gulf Coast 13-3. Stats: Dante Girardi had a home run against University while Mykanthony Valdez had one against Gulf Coast. This week: American Heritage (Plantation) on Tuesday, Chaminade Madonna on Thursday. Results: Defeated Tampa Prep 7-1 and Tampa Catholic 11-1. Lost to Barron Collier 5-3. Stats: Peter Stavrakos was 3-for-3 with a triple and Josh Emerson struck out 10 against Tampa Prep. Nolan Hudi got the win in the second game striking out eight. This week: Brooks DeBartolo Collegiate on Tuesday, Largo on Thursday and Berkeley Prep on Friday. Results: After losing or tying first three games, has won 17 in a row. Last week: defeated Fort Bend Dulles 6-4 and Fort Bend Kempner 14-4. Stats: Hayde Key struck out 10 against Dulles. Austin Bradbury had a home run against Kempner. This week: Fort Bend Bush on Friday. Results: Has not played since winning Boras Classic South. Had a horrible trip to Alabama last month, losing all five games. Has gone 9-2 since then with wins over Huntington Beach, Ayala, La MIrada and Notre Dame (Sherman Oaks). This week: Orange Lutheran on Wednesday and doubleheader on Friday. Results: Defeated Glenn (Kernersville) 7-1 and 7-3, Southeast Guilford (Greensboro) 4-3. Stats: Carson Whisenhunt struck out 10 and Joe Johnson had two doubles in the first win over Glenn. Whisenhunt then had a double in the second game. Garrett Chandler had a double against Southeast Guilford. This week: East Forsyth (Kernersville) on Tuesday and Friday. Results: Defeated Marist (Chicago) 3-0, IMG Academy (Bradenton, Fla.) 3-2, lost to Harvard-Westlake 6-1 and Monsignor Pace 5-3. Stays in rankings based on win over IMG Academy. Stats: Steele Chambers had a double against Marist and Jake Smith had two doubles against IMG Academy. CJ Abrams had a double in the loss to Monsignor Pace. This week: Wests Hall (Oakwood) on Monday and Wednesday, Chestatee (Gainesville) on Friday.